Masao Kagawa Shihan 9th Dan JKS, once again returned to England for his annual visit and what a spectacular course it was to be. 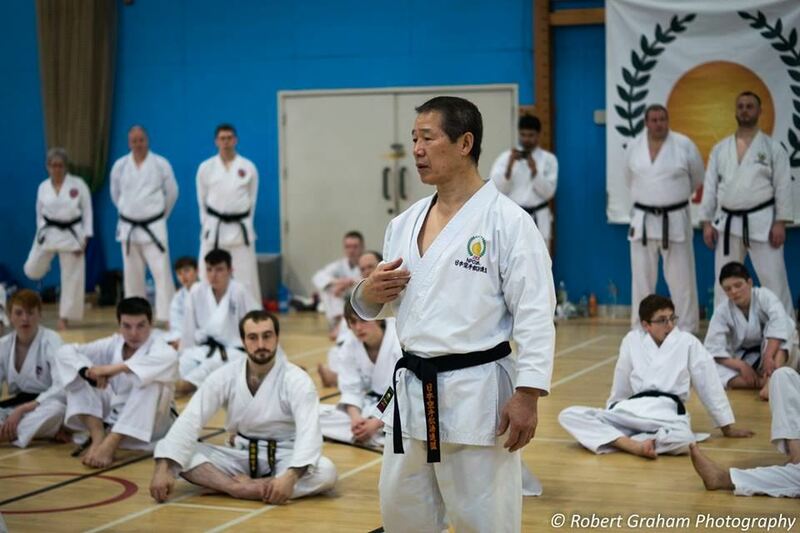 Hosted in Nottingham on Friday 9th and Saturday 10th March, Kagawa Shihan could not have continued to be a more perfect advert for Shotokan Karate. Ever increasing in his influence from beginner to world level, blending the traditional with sports karate, the JKS is spearheaded by a gentleman with karate running through his veins. Kagawa Shihan now holds many positions documented here and all students benefit greatly from every aspect of his nature and character. The course began on Friday evening with an introcudtion bu Head of JKS England Alan Campbell Sensei 7th Dan JKS. A special dan diploma presentation was then made to Hans Rana Sensei for achieving his 6th Dan and there is no better way to receive your certificate than from the World Chief Instructor himself! After battling traffic for many, a good warm up set the class in motion for a focussed look at kihon. Kagawa Shihan does not divide his time when teaching but always mentions both traditional karate principles and techniques alongside sporting ones, providing the busy hall with a wealth of information to apply in all aspects of the art. Starting with punching to concentrate on hip action, shoulder snap and timing this was repeated to different angles and then combined with footwork to capitalise on the key teaching points practiced. Kagawa Shihan then spent a good amount of time combining squatting with punching and kicking exercises to demonstrate good posture, compression/loading and the release of this to execute solid techniques. 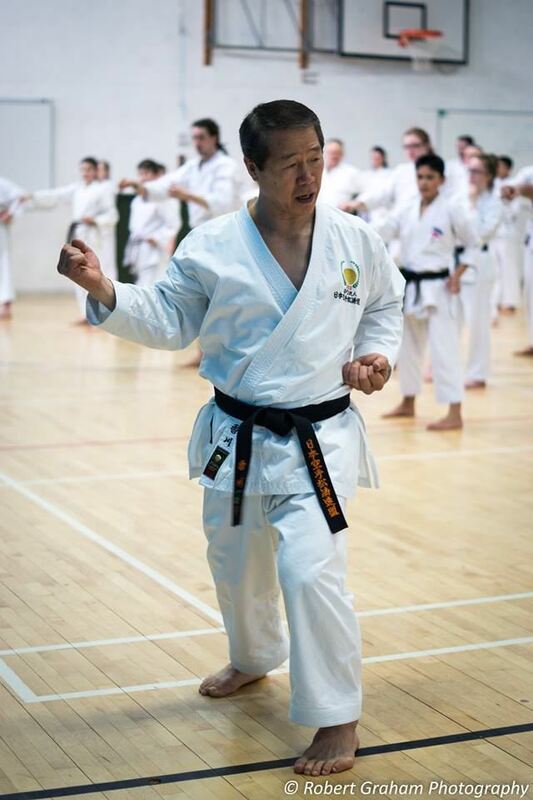 Kagawa Shihan always teaches with a smile on his face and the relaxed environment gives students the ability to enjoy every second, no matter how challenging it is. The course then moved on to some blocking/punching and kicking combinations but never losing attention on the importance of basic technique. Kagawa Shihan suggested that students should always maintain concentration on their karate to help make small improvements each time by adjusting their practice to ingrain good habits. Distance, speed and posture again, were all focal points of the kicking elements practiced and Kagawa Shihan never fails to impress with his demonstration of how kicking should be performed. Moving on to Jo No Kata then Heian Shodan, Nidan and Sandan, the kihon elements were reinforced. Covered by a technician known throughout the karate world for his understanding and ability to deliver these as close to the desired blueprint as possible, students thoroughly enjoyed watching the master in action! Throughout the evening Kagawa Shihan had also picked a number of specific movements to repeat and it finished with uraken. Partners were utilised to practice this technique with maximum shoulder action and from all angles as a block, strike and spinning technique. A brilliant way to end the first day of the course, students could not believe where the time had gone and the humility and experience to which they were exposed. Kagawa Shihan gave a number of anecdotes and offered many of his intriguing personal thoughts on Shotokan karate during the evening. Recounted with humour these explanations were a fantastic insight into the mind of the best. Please check out the JKS England Facebook Page for just some of these examples and some excellent pictures of Kagawa Shihan and students in action. The Saturday session also began with some grading presentations following recent successes for senior JKS England members and a fitting reminder of the talent within the association. A cheque presentation was also done on Saturday afternoon for the considerable sum of £2500, raised at the JKS Karate-a-thon, organized by Sensei Richard Fewkes 3rd Dan. This figure goes towards the JKS England Squad which continues to impress, developing under the tutelage of its great coaches Matt Price Sensei and Nick Heald Sensei. After the warm-up, started the training for day two. The themes of the day were control, correct technique, yakusoku kumite, the first three Junro kata, bassai dai and a few insights into his karate past and his views on the future of karate. Our session began with Kihon : gyaku-zuki - Shihan focused on the importance of having a rooted stance, full rotation of the hips, connection with the floor through a straight back leg and a drive forward at the hips. After partnering up, focused on the correct use of control with accurate technique. Stepping in Oi-zuki, delivered from a full stance, with just dogi connection. Mae-geri was delivered to the knot of your partner’s obi. We then moved on to Yakusoku kumite. Shihan explained that yakusoku means promise. It covers the range of all announced kumite; gohon, sanbon, kihon ippon and jiyu ippon. The “promise” refers to the target area, but also means to give a solid spirited attack that will focus the defenders skills and advance their karate. Shihan demonstrated mawashi and ura-mawashi geri bringing both techniques from the centre line so the opponent was unsure what technique was arriving. 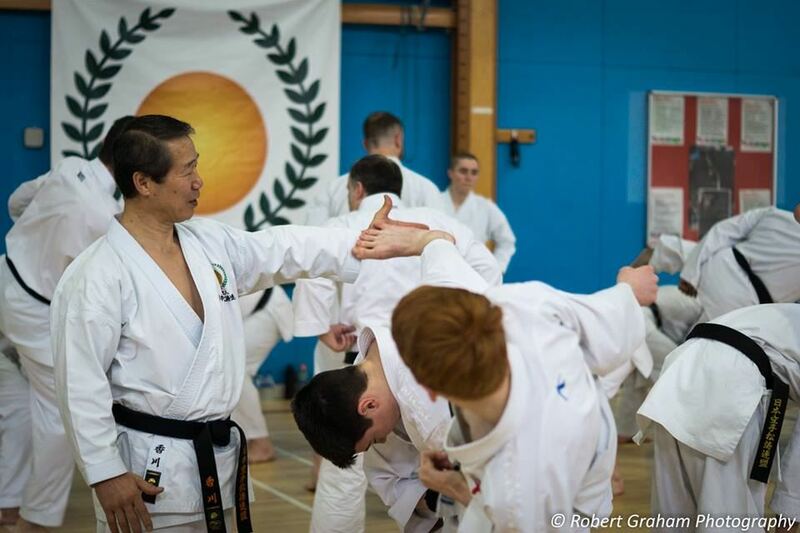 Ippon (one step) kumite was used as the framework for the start of the lesson and students wer e shown the benefit of simplicity in their defensive responses with some excellent demonstrations from senior JKS England students alongside Kagawa Shihan. As the partner work progressed, Kagawa Shihan always related the practice to its place in developing kumite skills and the need to be able to approach the drill work in the same manner as when the attack is unannounced. Kicking over partners then challenged students to push themselves and realize the need to practice all elements of the techniques; knee lift, posture correction and hip opening are just some examples to truly address the improvements possible. It was refreshing to see Kagawa Shihan challenging himself and (only very occasionally) losing balance, a fitting reminder that staying within your comfort zone will not yield the major rewards which karate can offer. Kagawa Shihan also demonstrated control by kicking a roll of tape off the top of a student’s head, a great video to watch as in the process Kagawa Shihan, like only he can, kicked a bit too high a jodan on one of his attempts! Working quick responses to the attacks, students had also been able to choose between different attacks to increase the unpredictability, an excellent way to cement good responses if students could stay relaxed enough. Kagawa Shihan continued to give the fully subscribed class a number of analogies of his observations which show that his thoughts are always on karate. Relating the feet in stance to a green frog gripping a window pane, Kagawa Shihan does not restrict his karate thinking to the dojo but looks outward for inspiration, something which is passed on to students immeasurably. Shihan shared that he had not started karate until he was seventeen. His instructor was his older brother Masayoshi Kagawa (who was All Japan Champion). His brother promoted other students through the Kyu grade system, but would not examine him. He was to remain a white belt until after training for two years and reaching dan standard, then his brother promoted him to Shodan. He explained that he felt awkward making the jump from white to black belt in a single step. Kagawa Sensei then went through Junro Shodan, Nidan and Sandan. With students nice and relaxed, this was the perfect time to cover the ideals held within this set of katas. 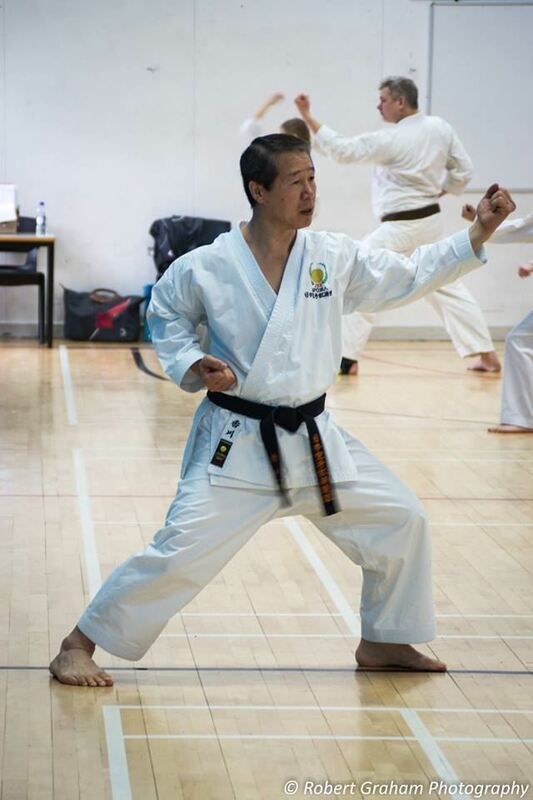 Asai Shihan developed the Junro kata with the aim to develop the karatekas ability, introducing neko-ashi dachi and spinning techniques. Shihan started with Junro Shodan training hikioshi which is the push and pull distance in ma’ai and one handed techniques. Junro Nidan developing morote-waza, two handed techniques. Shihan’s focus was on correct stance during delivery and the double count of the striking / blocking combinations. In Junro Sandan uchi-waza, striking techniques were developed, Shihan also stressed that in Junro kata the fist position is aligned with the eye, differing from the Heian kata where the upper arm is horizontal. Again correct use of the hips when performing both inside and outside strikes. After the break kiba-dachi was utilised to work on some different themes and bolster points already covered by Kagawa Shihan. It was then on to Bassai-Dai which made for a particularly interesting end to the course. Shihan explained that Bassai-dai was his Tokui kata, he had performed this kata for every one of his dan gradings from Shodan to Hachidan. When asked why, he explained that he thought that Bassai-dai suited his body and his karate. Shihan has developed his Tokui kata through the years and explained that he did not understand why most karateka swapped their selection of kata, why change? Shihan’s instruction on Bassai-dai included the following points, at the end of the shuto sequence the step backwards in shuto and the drive forward with tsukami uke should be executed as a double count. The preparation for the gedan kekomi in the following technique should see the knee raise high through the arms without any disturbance of their position. Prior to yama-zuki a full koshi-kamae should be performed. In the yama-zuki the fist position are vertical and inline with the front of the lead foot. Shihan demonstrated yama-zuki against the wall to show perfect alignment. When executing sukui-uke the foot rotation is developed from hip rotation in a similar way to the choku-zuki / uchi-uke combination. In the final shuto-ukes the rear foot should be placed directly under the hip to drive into kokutsu-dachi. Shihan spoke of karate being an art. If a painter paints a picture it is a one-off, it can never be created exactly again. This is the same in kata, no two kata are ever the same once you have performed your kata it has gone and can never be reproduced exactly the same. If a hundred of us performed bassai-dai there would be one hundred different versions, no two would be the same. We should strive to develop our own kata and our own karate. We are all different ages, we have different experiences, differing body types etc. Shihan spoke how Nakayama Shihan made some developments to karate when he headed the JKA. Asai Shihan’s innovative contribution to the art of karate developed shotokan further and this development should continue.